If content and cost are your considerations, Fundamentals of Journalism is the book you want to purchase. Written by R. Thomas Berner, professor emeritus of journalism and American studies at Pennsylvania University (sic), this book includes much of the content he wrote in previous titles (The Proces of Writing News, Writing Literary Features, The Literature of Journalism, The Proces of Editing, and Language Skills for Journalists). Four basic sections: Reporting, Writing, Editing, and Law and Ethics are supplemented by excellent appendices on sentence structure, grammar, punctuation and style. Chapters 9 and 10 - the Editing Function I and II - stand out. These chapters should be required reading for all journalists, students and media professionals. The reader follows the copy editor and understands the importance of news flow, writing style and precision, appreciating all the while the power of writing and editing. From Quill, Vol. 82, No. 1, October/November 2007, pp. 16-17. "The 34 essays in this book treat both media bias and war coverage, doing justice to both topics. Expanding on some of the criticisms Danny Schechter levies in his less scholarly volume, Embedded: Weapons of Mass Deception (2003), this book looks at the conflicted role of the embedded journalists and the propagandistic nature of mainstream media. Notable in particular are discussions of media language, metaphors of war, analysis of late-night talk-0show humor, and censorship of the media, particularly Arab media outlets." "Global Media Go to War is valuable to scholars of wartime journalism and propaganda. Its best chapters reveal many nuances that do not fit into sound bites and remind readers that covering war accurately and fairly can be hell." "This book has great value for students and citizens who want to compare competing analyses of media war activity." 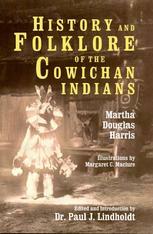 In the late 1800s, Martha Douglas Harris (the halfbreed daughter of the former governor of British Columbia) witnessed first hand the destruction of the Cowichan tribal culture in Vancouver, Canada. Deftly edited by Paul Lindholdt (Associate Professor of English, Eastern Washington University), this edition of Martha's History And Folklore Of The Cowichan Indians is a faithfully reproduced reprint (including the original illustrations by Mar-garet C. Maclure) of this collection of Native American folktales first published in 1901 to honor Martha's Cree Indian heritage. Also included is Martha's back-story account of being a Victorian woman whose father had hoped to conceal her mixed-blood heritage. An accurate reproduction, this Marquette Books edition does correct for grammatical errors and one factual error, thus providing contemporary readers with a significant and seminal contribution to Native American Studies supplement reading lists and reference collections. In many ways, China Girl recalls the fairy tales we all read as children. Except that the hero in need of rescue is 46-year-old WSU professor David Demers, who longs for fatherhood despite his single status. The princess who rescues him, winning his heart�and ours�is a Chinese toddler named Lee Ann. While Demers is studying the Care and Feeding of Small Children at a WSU daycare center, Lee Ann is found abandoned, umbilical cord still attached, in a village near Hefei, China, and taken to an orphanage. At eight months she is "gentle and clever, a little introverted, a little afraid of strangers." At 17 months, she�s ready to meet her Daddy. As in any fairy tale, there are dragons to be battled along the way. "Yes, she was scared," Demers recalls of their first meeting. "But that was nothing compared to what I was going through. What if she cried all the time? What if she didn�t like me? What if she hated me as she grew up, pierced every part of her body, and became a drug addict? Or worse yet, what if she became a fan of Rush Limbaugh?" This book is a great read for a number of reasons. First, Demers� decision is unique. Although some 5,000 Chinese babies are adopted by Americans each year, new parents are mostly couples, followed by a smaller number of single women and an exponentially smaller number of single men. Demers� home study adoption worker had seen only three single fathers in 20 years. Second, the details of adoption and adjustment are just plain fascinating. But most compelling of all is the way this heartwarming story reminds us of what�s good and lovable in the relationships around us. His arrival in China to pick up Lee Ann, their first meeting, his trials at new fatherhood are all included, and specifics about the adoption process are also provided. His professorial tone gives the writing confidence, and his caring observations and humor make it simply touching. Very enjoyable style of writing! Great sense of humor! 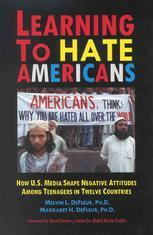 ... Learning To Hate Americans: How U.S. Media Shape Negative Attitudes Among Teenagers In Twelve Countries is a crucial and astute survey of how the United States is perceived abroad, especially among the youth of other nations. Meticulously gathered data paints a bleak picture, one that identifies America in the eyes of teenagers abroad as a land of violence, crime, and sexually immoral women.